The Queen of Wands is a card with a passionate personality and a quick temper. She is self confident and happy. She is lively, active, and warm natured. Mary Winchester is all of these things and more. 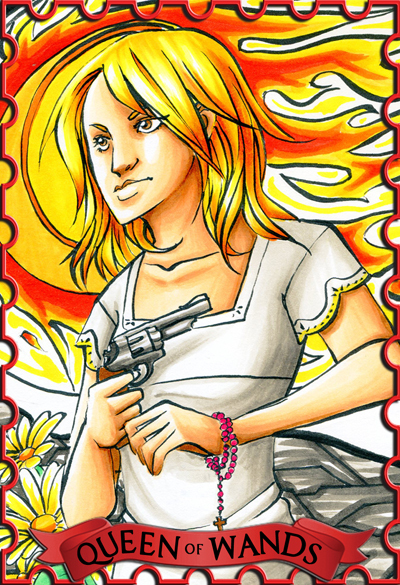 The original card shoes the queen holding her wand (or in this case, gun) in her right hand, with sunflowers blooming behind her or in her left hand. The lions on her throne are represented by the fiery explosion behind her bursting forth like a mane. Normally a black cat would represent the darker side to this card, but I opted for a dark patterned background as this representation.